Comes something so innovative, so earth-shattering, so downright revolutionary... it just might forever alter the course of history... forever. Or at least, like, keep your beer cold. 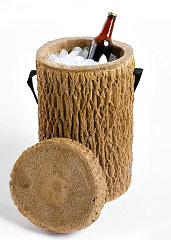 Feast your eyes on Stump Cooler. It’s a cooler. That looks like a tree stump. And feels like a tree stump. But, nope, it’s a cooler. Available online now. On one hand, you’ve got a cooler. You know how those work. Lid opens up. Beers go inside. Lid gets closed. Beers stay cold. And on the other hand, you’ve got a log. It looks like a log. Also, fishing. See, besides being able to easily hold up to 12 cans of your favorite frosty beverage, they also sell an attachable aerator for this thing. So it’s great for storing bait.